Desktop unified communications applications offer a more complete experience when compared to UC products for mobile devices, said Stephen Tong, senior director of infrastructure services at Avanade. "The desktop-based applications are the richest typically, in terms of functionality. You can do the most. That's where you can share applications and collaborate intensely," he said, adding that it's not to say mobile unified communications (UC) is substandard. "I wouldn't say [mobile UC is] a second-class system ... It's a good experience, but ... it's different." 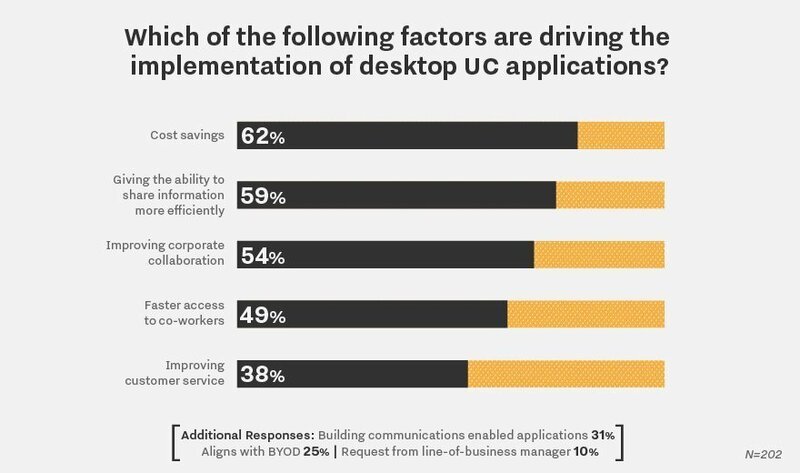 Many factors could motivate customers to implement desktop unified communications applications; but according to TechTarget's survey results, cost savings is chief among the drivers, selected by 62% of the respondents. While the survey didn't drill into how exactly respondents expected to achieve cost savings by implementing desktop UC applications, many of them may have had UC's general economic benefits in mind. These savings can come from having a consolidated communications infrastructure: Instead of replacing legacy technologies, customers can have all of these functions integrated within their UC products. "Unified communications is really about bringing in all of these real-time technologies and ... UC features running on your data network. If we bring it all together, theoretically it's supposed to be cheaper," Tong said. Customers may also save money that they would have otherwise spent on communication services and employee travel. Not far behind cost savings were two implementation drivers related to productivity: gaining the ability to share information more efficiently, cited by 59% of respondents; and improving corporate collaboration, cited by 52% of respondents. What desktop UC apps do you generally recommend to your customers?